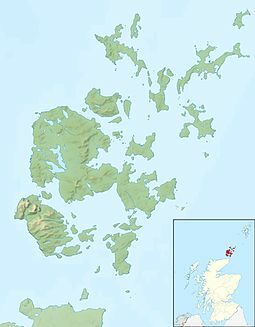 The Orkney Islands (often also called only Orkney) is an archipelago in the Northern Isles of Scotland, United Kingdom. It is about 16 kilometres north of Caithness. 20 of the about 70 islands have people living on them. The administrative centre is Kirkwall (with about 8000 people living there). The next largest settlements are Stromness (2000 people) and St. Margaret's Hope (with about 550 people). In addition to the mainland, most of the islands are in two groups, the North and South Isles. All of them are made of sandstone. The climate is mild and the soil is fertile. Most of the land is farmed and agriculture is the main source of income for the economy. There are many birds and fish. Ferry services go much of the time to Lerwick (on the Shetlands). Most islands have air strips (for airplanes). This includes the shortest known flight service in the world, between Westray and Papa Westray. Official flight time is 2 minutes. If the wind goes in the right direction, the flight can take just over a minute. ↑ Haswell-Smith (2004) pp. 336-403. ↑ Wickham-Jones (2007) p. 1 states there are 67 islands. 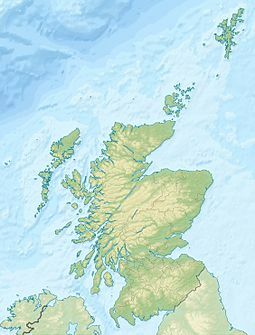 Wikimedia Commons has media related to Orkney Islands. This page was last changed on 19 April 2018, at 09:22.